The National Water and Climate Center, a division of the National Resources Conservation Service (NRCS), offers the latest water and climate news and information "to help people conserve, maintain, and improve our natural resources and environment." 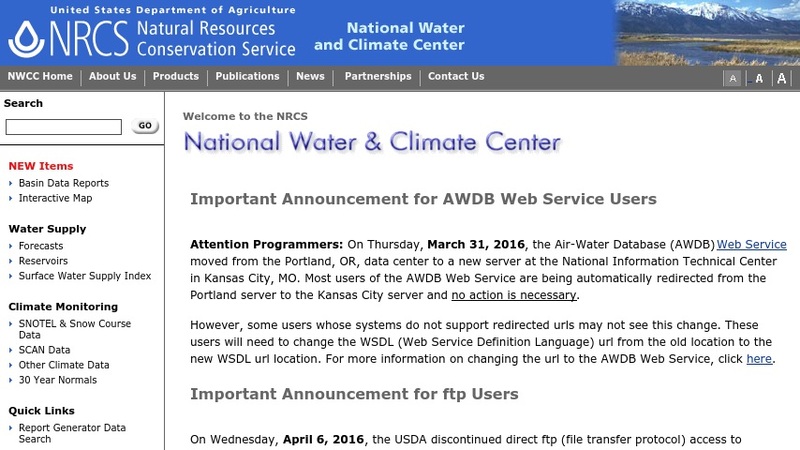 Users can receive water supply forecasts, snow data, and the latest program updates. The web site introduces the Soil Climate Analysis Network (SCAN), which is available for most of the United States, and the SNOTEL Data Network, which supplies real-time Snow and Climate data in mountainous regions in the Western United States. Researchers can obtain copies of many of the hydraulics and hydrology tools and models including HecRas, which estimates water surface profiles, and EFH2, which determines peak discharge. The site provides an abundance of conservation planning information about nutrient, pest, animal waste management, and salinity management, as well as water quality, wetlands, and drainage.